Nestlé has a vision for the next evolution of food. The modern food movement has brought us to a fork in the road. On one path are people who say it is enough to eat the fresh fruits and vegetables that spring from the earth, the milk from our cows, and the meat from farmed animals. Simplicity is the path to fulfillment, and sticking close to nature and whole foods is the safest bet for achieving nourishment. The other vision prescribes that the best diet is one that is predetermined for us, collected by farmers and tinkered with by scientists to help us attain our maximum health and eventually prevent chronic illness. It is more obscure and decidedly high tech. This is where Peter Brabeck-Letmathe, the outgoing chairman of the world’s large food company, has staked his flag, casting Nestlé—with its $88.8 billion in annual revenue—not as the purveyor of natural foods or conveniently-available snacks, but as the vessel to deliver a new, scientifically engineered Garden of Eden. Brabeck-Letmathe, 72, got his start decades ago, loading boxes onto the back of an ice cream truck in Central Europe. He has witnessed changes in agricultural production practices, the rise of and rebellion against processed foods, and the scourge of chronic illnesses left in its wake. In rising to the apex of Nestlé, he has become the chief architect of the company’s vision for the future, a reality in which food operates more like medicine. Nestlé, of course, has been fortifying food since founder Henri Nestlé began selling an iron-enriched infant cereal called “Farine Lactée” in 1867. And the company will still make chocolates, ice cream, and most of the pizzas and meals found in supermarket freezer sections. But it is also investing billions of dollars in healthcare firms. In steering the company in this direction, Brabeck-Letmathe has forged into new territory, carving out a “nutrition, health, and wellness” industry. This is a shift from what food companies such as Danone, PepsiCo, and Kellogg have done for decades. 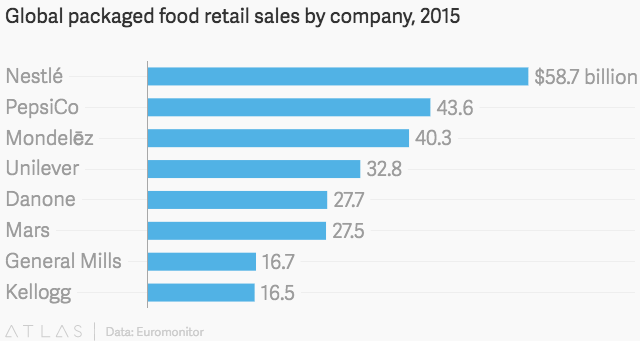 The biggest companies have focused mainly on one goal: getting calories to people. They created new technologies to do it, drying and freezing food, then shipping it across the trade routes of an increasingly connected global economy. But as Brabeck-Letmathe would discover around 1995, that crude vision for calories only worked to a point. To continue carrying out Brabeck-Letmathe’s vision, Nestlé in June named Paul Bulcke, its current CEO, to replace Brabeck-Letmathe after he retires in April 2017. In taking the reins, Bulcke will inherit a role that requires firm resolve as Nestlé seeks to assert its dominance in this new industry that sits squarely between food and pharmaceuticals. The company also chose Ulf Mark Schneider to take over as CEO. Schneider was lured to Nestlé from Fresenius, a German healthcare firm. It’s perhaps not surprising that Brabeck-Letmathe’s food views differ from those of most big food company executives, because he doesn’t think about food in English. Rather, the Austrian returns to his native tongue, in which food is a four-syllable mouthful that strikes at the core of his philosophy. If food is primarily perceived as a means to long life, then it begins to make sense that Brabeck-Letmathe would seek to design it as vehicle for delivering micronutrients such as magnesium and zinc. It’s not about the number of calories you eat or even if they come in the form of fresh fruits and vegetables. It’s about the quality based on what people need. Brabeck-Letmathe says he arrived at the idea of food as medicine after waking up in a New York hospital bed after a back operation in 1994. As he stirred from narcosis, he vividly remembers a nurse standing before him with a tray of plain food. He pushed it aside in disgust. Upon recovery, he returned to the company’s headquarters in Vevey and instructed his food scientists to research a line of fortified foods specifically for recovering patients in hospitals and cancer wards. These products would be easier to chew, swallow, and digest, but most importantly they would be nutritious. One of them was Nestlé Thickenup, which can make foods and beverages easier to swallow without impacting taste. The following year, Brabeck-Letmathe discovered studies showing that, at about 70 years old, eating more than 2,500 calories a day did not necessarily increase life expectancy. Meanwhile, consumers began worrying about how processed foods loaded with preservatives, sodium, and sugar affected their overall health. It didn’t bode well for established food companies. Kellogg, Danone, and General Mills had portfolios chock-full of sugary cereals and yogurts; Nestlé’s freezer section products—which include Stouffer’s, DiGiorno, and Hot Pockets—were filled with ingredients that unnerved shoppers. There’s a wonderful audacity in this…I hope they are right. Nestlé tackled the problem earlier than most, reformulating many of its products to remove trans fats, sodium, and sugar. It redesigned food packaging to more clearly tell consumers what was inside their Lean Cuisine and DiGiorno pizza boxes, and to illustrate healthier portion sizes. This would be the company’s initial response to a much bigger question about how to adapt to a shift in consumer expectations. The long-term answer was for Nestlé to pursue the research needed to give people individual diet plans. In Brabeck-Latmathe’s future, people will undergo health testing during varying stages of life to learn more about the genetic material of the microbes—the bacteria, fungi, protozoa, and viruses—living inside their bodies. Each time, the tests would analyze genetics, caloric levels, predisposed illnesses, and more. Such information would allow Nestlé to create products that essentially act as medicine to alleviate known health issues. To deliver on this vision, Nestlé began buying and partnering with clinical wellness firms, striking deals with seven between 2007 and 2016. It began increasing its research and development budget and now spends more than any other food company on R&D, although it still spends significantly less than drug companies such as Johnson & Johnson (paywall). In 2007, Nestlé acquired the Novartis Medical Nutrition division for $2.5 billion. In 2010, it acquired for an unspecified amount Liverpool-based Vitaflo, which develops “nutrition solutions” for people with genetically-inherited metabolic diseases. In 2011, it bought for an unspecified amount of San Diego-based Prometheus Laboratories, which created diagnostic products for gastrointestinal diseases and cancer. In 2012, Nestlé bought a minority stake in Accera, which researches and develops (not without controversy) medical nutrition for neurodegenerative diseases such as Alzheimers. That same year it began a 50-50 joint venture with Chi-Med, a Chinese pharmaceutical company to develop plant-based products for gastrointestinal health. In 2013, it acquired Pamlab, which works in therapeutics for brain and metabolic health (again, for an undisclosed amount). Nestlé isn’t looking to enter the prescription drug business, but through these partnerships and acquisitions it plans to apply its new scientific knowledge to food products—something that could one day include a frozen pizza that’s healthy and prevents Alzheimer’s disease. He also describes installing Nestlé data into sensors implanted beneath a person’s skin that might send an alert if you have an iron deficiency, or need to schedule a doctor’s appointment. Eventually, your sensor might directly connect to your doctor’s office, alerting a physician if an abnormality is detected. It’s a vision for a more digitally-connected health system, one he hopes might catch Alzheimer’s, early onset diabetes, or even the early stages of cancer, of which Brabeck-Letmathe is a survivor. As the company incorporates its know-how into hardware, it will further develop its food products, sweeping out more sugars, salts and preservatives, replacing them with micronutrients and potentially with phytonutrients—plant-derived compounds hypothesized to be responsible for much of the disease prevention provided by plants. In theory, if a watch or implant tells you that you need more magnesium in your diet, consumers will be able to go to the grocery store and find products—made by Nestlé—to deliver that nutrient. Nestlé headquarters in Vevey, Switzerland. This high tech vision is a far cry from the dietary practices preached by Michael Pollan, the best-selling author of In Defense of Food: An Eater’s Manifesto. Pollan opened that book with a far more simple approach to health than the one Brabeck-Letmathe envisions: “Eat food. Not too much. Mostly plants.” It’s a perspective almost diametrically opposed to the one offered by Brabeck-Letmathe. Pollan says the vision by Nestlé is interesting, but is far in the future. Giant food manufacturing companies, including Nestlé, have continued to aggressively advertise processed foods that have stoked the increase in chronic illnesses, Pollan says. That the company would now seek to create foods to solve those problems is noteworthy, especially at a time when humans still don’t understand the role of fats in the diet, or even how the body metabolizes certain foods. Pollan pinpoints infant formula, a banner product in the Nestlé portfolio. It still can’t match the benefits of breast milk. Shouldn’t a good diet be self-evident, that we should turn to food that grows from the ground? Let me start with your vision. Your vision is basically saying that nature is good. That’s wrong. Nature is not good to human beings. Nature would kill human beings. The reason why homo sapiens have become what we are is because we learned to overcome nature. You see, what makes us different from the animals, why we were able to develop afterwards, intelligently, was we learned how to cook. That is something that is completely underestimated. So cooking then is just a bridge to the next thing, a predetermined, scientifically-made, perfect wonder meal? This idea about the wonder food. First of all, it exists. I mean, for example when we had the first man on the moon, these people received special nutrition. I think they have an absolute right to exist. I am the first one to say, I’m eating an enormous amount of vegetables. I like vegetables a lot. But I also know that it’s not enough for me anymore. At New York University, nutrition and food studies professor Marion Nestle (no relation to the company) remains a skeptic. She considers Brabeck-Letmathe’s foray into “health and wellness” a “techno-fix”—effectively selling consumers a high-tech bill of goods they’ll never need to enjoy a healthy life. She puts the strategy in the same light as Soylent, a meal-replacement drink forged in California and heralded by Silicon Valley. Brabeck-Letmathe’s vision can sound like that of a profit-minded food executive peddling a new version of processed food. For those who’ve spent much of their careers arguing for simple, fresh food straight from the farm, it challenges the idea that the Earth can supply its humans with all the things they need to live long, productive, and healthy lives. Any publicly traded food company lives by short term profit goals, he says. Nestlé isn’t an exception. Braback-Letmathe argues otherwise. Nestlé’s pharma-style acquisitions occurred while its competitors navigated fickle consumer trends toward healthier snacking and convenience. Coca-Cola bought Honest Tea Company in 2011 and recently pushed into designer milk. General Mills spent $810 million to buy Annie’s, an organic food brand. 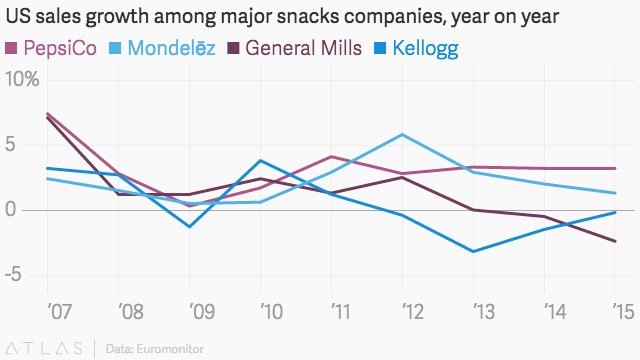 Kellogg has been hunting for ways to regain control of breakfast by expanding its line of breakfast cereal bars. 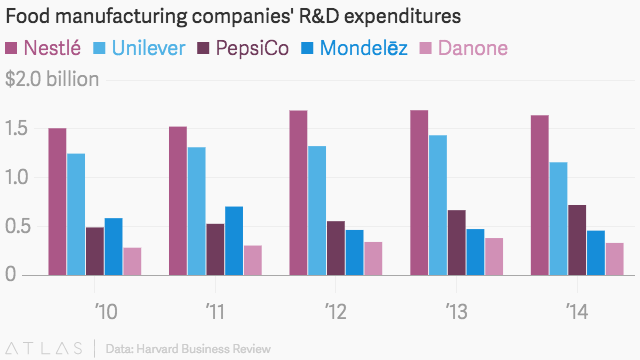 PepsiCo has struggled to introduce (paywall) healthier products. Its attempt to acquire Chobani yogurt brand was snubbed. Brabeck-Letmathe believes consumers will care more about health than convenience in the long run, and that spending lots of money to acquire new food companies won’t best advance his mission or lead to better margins. This position has left some industry analysts scratching their heads, because it’s unclear to them whether Nestlé, in focusing on healthcare companies, is missing newer food trends on which younger start-up companies are building their brands. But Brabeck-Lethmathe isn’t worried. He said Nestlé has an outpost of 15 employees in Silicon Valley, whose job is to monitor the work of upstarts. If the company sees a concept it likes, it turns to in-house expertise. “It is important to know what’s going on and to apply that to our existing products,” he says. 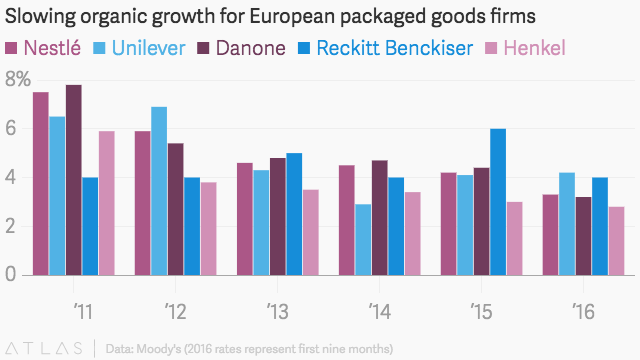 As Bittman points out, Nestlé’s vision also is motivated by the need for growth. Like other packaged goods companies, sales growth has slowed in recent years, says Paolo Leschiutta, a food and beverage analyst at Moody’s in London. Sales growth in emerging markets (though still in the high single digits) has started to sputter, and low inflation has made it difficult to increase prices. About 44% of Nestlé s food sales come from emerging markets. At the same time, volatility in Russia, Brazil, Nigeria, and Turkey have created stiffer macro-economic headwinds. Even China, with its rising middle class, has experienced a GDP slow-down, another foil to growth. For those reasons, the rationale behind Nestlé’s expansion into foods that operate more like medicine becomes clearer, Leschiutta says. Analysts say the shift by Nestlé could very well trigger an evolution in food, but it will likely take years before that trend takes hold in mature and emerging markets—perhaps more than two decades. This is no surprise for Brabeck-Letmathe, who earned the support of the company’s board in the early 2000s to begin exploring more work within pharmaceuticals, even if it meant playing the long game. And he’s played it for a long time. After five decades of working at the 150-year-old Swiss conglomerate, Brabeck-Letmathe looks forward to controlling his own time. He most fondly recalls his work at the beginning of his career, as an ice cream salesman. He would wake up each morning, load his truck after considering the weather—on cold days people ate more creamy ice creams, on warmer days they opted for a more watery confection. He did this day-in and day-out, describing the work as liberating. The question-and-answer portions of this story have been edited and condensed for clarity.